Perthro is the half-month stave through 28 January. Othala is the intuitive stave, and Thurisaz indicates the Futhark’s message to us. Read right to left is Perthro, Othala, then Thurisaz. Working with Perthro over the last week has given us a sharp lesson in where we’re strong in our weaving, and where we need more work. Perthro is the rune of chance. In the last episode of What in the Wyrd, I talked about the difference between chance and luck, which well summarizes the aspects we need to consider when judging ourselves against Perthro. If anything, when it arrives seasonally, we have the opportunity to assess our comfort level with the unknown, not just in life, but in ourselves. Most often this rune is superficially treated as a yes/no on some life dynamic or circumstance, which is completely permissible. However, leaving it only to such simplicity misses the nuance it can bring, in terms of self-awareness. When we encounter Perthro, we have to be very secure in the unknown, and the unknowable. It represents both the dynamics of ourselves and life that affect us. 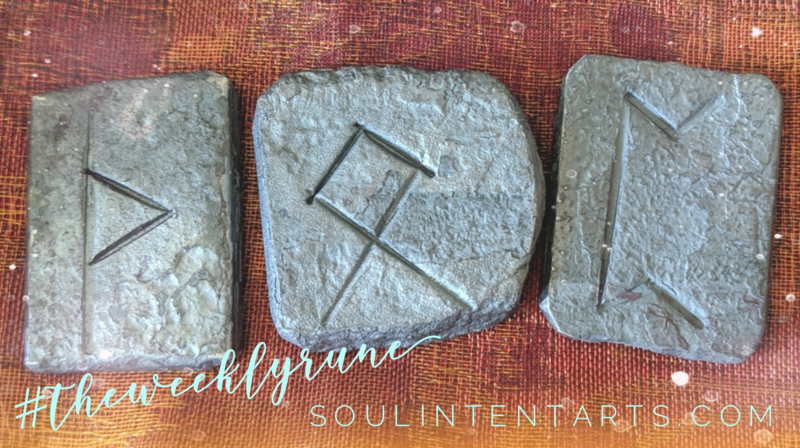 Within this rune lies the formula for how to create and cope with all that life brings, along with the realization that even parts of that formula are also unknowable. If this exploration of Perthro is beginning to sound circular and open-ended, that’s because it is. When working with Perthro, we have to examine the framing runes very carefully to hone its focus. This week, Othala is the rune describing how to best work with Perthro, and it always points to lineage. It focuses on the hyper-distillation of the present, which we can only really understand by looking back, and forward. Othala is about issues of our Ancestors, and by default, how we are becoming an ancestor to our descendants. It pairs really nicely with Perthro, as Othala encourages us to be very clear in our Innangarðr and Útgarðr. Where Innangarðr is the known territory, the boundary of our clan, Útgarðr (sometimes Útangarðr) is the wild beyond, past the point of the known border. In the Old Norse context of clan dwelling, these boundaries are established when we were born. The mapping of what’s safe, what’s wild, and the point that we should push beyond what we know and into the void would have been wisdom passed on by elders. Thurisaz from the voice of the Futhark suggests that we work deeply on finding center amidst difficulty. As this is just a commentary rune it doesn’t mean difficulty is coming. And yet life is life. Difficulty is always coming as much as is ease. Learning to cope, in general, is the best magick we have. The medicine Thurisaz brings is to use part of our times in ease to develop those coping skills and be trained in when and how to use them, as needed. 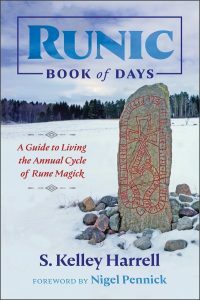 Pointing back to Othala, the runecast offers the Ancestors as a means of learning to find that center. Certainly they faced uncertainty and security. Perhaps engaging them this week would shed insight into how we can best weather the same. How has your comfort with the unknown shifted over time? What are the most important features of strong elderhood to you? The way that I use galdr is through chanting. I find repetition of the base phonetic helps me feel the rune. Remember that the Elder Futhark isn’t a language. It was originally an alphabet, incorporated into mythical origin. It functions phonetically, both in spelling and pronunciation. Given that, galdr isn’t terribly different from the overall pronunciation, and the emphasis is on the intention of the chant, not so much the pronunciation. My personal emphasis in galdr is on the vowels initially and I incorporate the consonants later. For instance, with Ansuz, I focus on ‘ahw-oo,’ before incorporating the middle ‘n,’ such as ‘ahwnsoo.’ There is no right or wrong with galdr (although I guess there could be a flat-out wrong? ), though often the final consonants aren’t pronounced, as in ‘ahwsoo.’ Practice galdring different ways, and go with the way that you feel in your body.